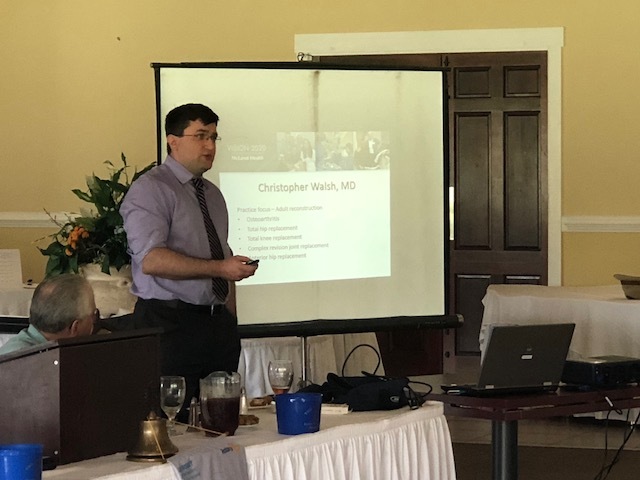 Our October 10th meeting and the North Myrtle Beach Rotary Club was quite informative, as Christopher Walsh, MD, from McLeod Seacoast paid a visit to our Tuesday luncheon! Doctor Walsh spoke about his specialty, joint replacement surgery, and specifically about the replacement options of the knee and hip. Dr. Walsh walked us through the process of joint replacement, typically beginning with the diagnosis of arthritis in most joint replacement patients. Arthritis treatment is typically first addressed with conservative remedies, including Tylenol, bracing, exercise, and weight loss. If non-operative treatment fails, or is unable to ease the pain or improve the mobility of the patient, surgery is the next option. There are a variety of knee and hip replacement methods, but can be broken down into two main categories: partial and full replacement. Dr. Walsh also touched on the vast improvement of joint replacement surgeries, especially in the last decade. In most case, Dr. Walsh has his patients up and bearing weight on their new joints hours after surgery! A wealth of knowledge that NMB Rotary found very interesting and informative! We thank Dr. Walsh for taking the time to visit our club, and appreciate his contributions to our local medical community!